Finally, the solution you have been looking for to assist you in your digital media processing from the time evidence arrives to dissemination. Perfect for individuals, smaller teams or agency wide. If there is one thing we have consistently heard regarding QuickDME, its that those that have it, love it With that in mind, we have no problem providing you an extended trial so you can learn first hand how QuickDME fits into your digital media processing workflow. Video, images, audio, documents and programs. Additionally, the data management engine preserves folder structures of ingested media to ensure proper play back of proprietary media files. Ingest and organize your evidence using workflow templates that removes user error while also collecting valuable metadata that can be easily accessed in reports such as, who collected the media, where, who checked it in and more. Once the media is ingested or linked, you have several options for viewing and processing. First there is the integrated QuickDME QuickView Viewer that can read many proprietary formats. For more processing, you can send the media to programs such Photoshop/ClearID, etc using the Sent To feature. Once processed, you can check in the media in as derivatives. Then when ready, you can disseminate your evidence using secured cloud web services such as Microsoft Azure, AWS and Drop Box. Once you ingest a proprietary player and associate it to its media format, any new evidence of the same type will be auto associated allowing users to simply right click on the media > view is associated player. If you have multiple licenses of QuickDME where you are sharing access to your your evidence via a network, this allows other users to access the viewers association in the same manner without needing to locate the appropriate players or even having it loaded on their system. Save Workspaces - Use QuickDME the way that works before for you. Player Manager (Manager) - Associate a proprietary player with their proprietary media type. Once new media is ingested of that media type, the association is already there for you and other users. Simply Right-Click > Play in Associated Player, and a virtualized player will load to view your media. Auto disc burning by Crime Type with various hash levels for ingested media. Custom Fields - Have a specific SOP you want to implement ? There are 10 customizable fields that allow you to easily do that. QuickDME™ is a digital media evidence management solution that can be used on a single forensic processing workstation station or grown to a multi-license networked shared solution for a unit or department. If after 60 days you are not convinced you need a license, all your data will be simply be organized in accessible folders for you. 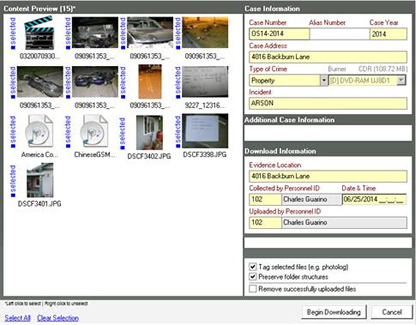 QDME allows you to set up dedicated kiosk ingest only stations where digital evidence gets ingested, tagged, and automatically burned to disc along with photo logs and upload logs. "QuickDME has helped us to simplify and standardize our agencies cataloging, auditing, and dissemination of all our digital evidence." I’ve used a previous version for years, so I was pleased to learn Ocean Systems acquired this product and did a major rewrite to support current versions of Windows, while also expanding the features, speed and security options. QuickDME™ is a work horse at our agency that brings organizations and efficiency to our entire digital media workflow. Need to Manage Your Crime Scene Photography ? Mark items as sensitive for restricted viewing, and more.